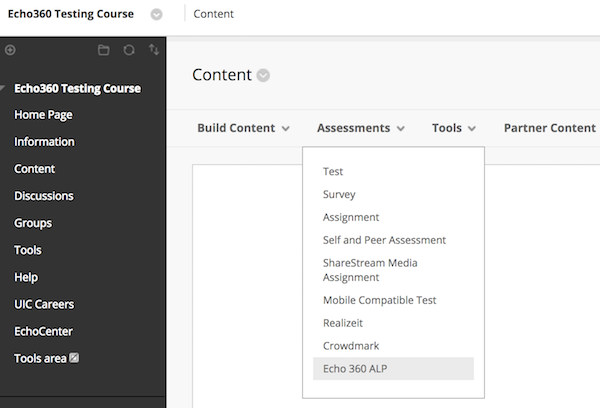 How do I add the Echo360 ALP LTI tool link to course content? This article details how to add a link to an Echo360 ALP section in a Blackboard Content area. A. Create the content link. 1. Log in to Blackboard and navigate to a course. 2. Click on a Content area from the selections on the left menu. 3. Click Assessments, then select "Echo360 ALP". 4. On the Create Echo360 ALP page, enter a name that makes it clear this is the link for Echo360 class content. This name will be the text of the link users will click to access their Echo360 content. For "Enable Evaluation", select Yes and configure the following fields:Points Possible: This does not affect the data sent from Echo360, but since most metrics are sent as percentages, we recommend entering 100. "Visible to Students": Set at your discretion. "Due Date": Leave this blank unless you have a reason to change it. 5. Configure the other options as necessary, being sure that "Permit Users to View this Content" is set to Yes. 6. Click Submit. The link should now appear (with the given name) in your chosen Content page. B. Connect link to Echo360 ALP section. 1. Click the Echo360 ALP link already added to the course. 2, Use the drop-down lists on the window that appears to find the course, term, and section. 3. If necessary select the Link to your Section Home radio button (it is selected by default). 4. Click Link Content as shown in the below figure. The LMS course/section is now linked to the corresponding Echo360 section. Users clicking the Echo360 link in Blackboard are taken to the Class List for the Echo360 section you just linked. 1. On the Course Content page, select Books and Tools under "Details & Actions". 2. Select the Echo360 tool. 3. Use the drop-down lists on the window that appears to find the course, term, and section. 4. If necessary select the Link to your Section Home radio button (it is selected by default). 5. Click Link Content as shown in the below figure. The LMS course/section is now linked to the corresponding Echo360 section. Users accessing the Echo360 tool are taken to the Class List for the Echo360 section you just linked.